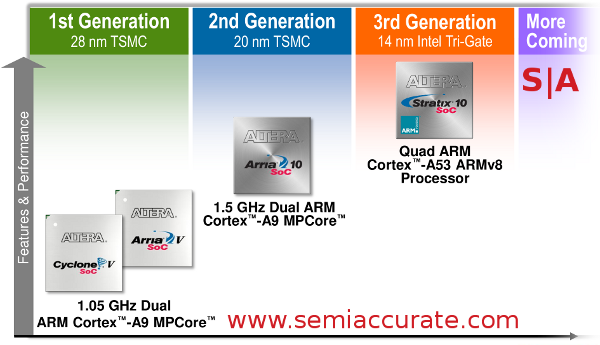 Altera just announced Stratix 10, a 14nm FPGA with four ARM A53 cores built on Intel’s FinFET process. While that sinks in we will just say that the interesting bits here are not in the headlines but in the implications. What are these bullet points? First of all there is the announcement of the device itself or two new devices, the Stratix 10 and the Arria 10 both with and without an SoC postfix. The presentation SemiAccurate got at Techcon didn’t say it outright but it seems a reasonable bet that the versions without the SoC don’t have the ARM cores in them. Of the two lines the Stratix is of course the biggest news, it has four ARM A53 cores and is built on Intel’s 14nm process. As you might expect, Intel making devices designed by their competitors is a big deal and something most observers would have bet against before this announcement. The Arria 10 is far less interesting with a 1.5GHz dual core A9 on TSMC’s 20nm process. Make a mental note of the process differences, we will come back to that. In any case the lineup looks like this. Notice the lack of clock speeds for the Stratix, the reason for that is probably because it hasn’t taped out yet. Altera representatives at Techcon said that the beast would tape out in Q4/2014 or about a year from now. This doesn’t take away from the magnitude of the release but keep in mind that we are a long long long way from silicon. Unfortunately that meant the presentation SemiAccurate got was almost all marketing fluff and precious little tech. Altera’s presentation made a lot of nebulous claims about performance, power, and capabilities but for a chip that is a year from tapeout, forgive us if we hold off on repeating them until the device is a bit more real. In any case since it is on the most advanced process on the market and way ahead of its rivals, it should be the fastest FPGA out there either with or without a hard CPU core. We are not implying that it won’t be a really good device, but since we won’t see it for about two years, a lot can change. So Intel is fabbing the Stratix 10 but not the Arria 10. One is FinFETs the other is not. One has specs, the other is smoke, mirrors, and rather fluid RTL. One is aimed at the very high-end, the other is a solid mid-range device. Why is this important, and most of all what does it all mean? How well does the XBox One do against sidechannel crypto attacks?